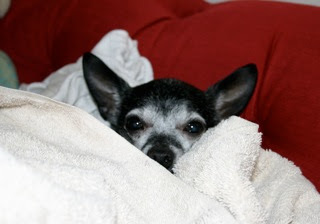 My 16 yr old chihuahua was fine--just a few bouts of coughing and once in a while vomiting his dog treat over the past few months. His appetite and poop has been normal. hen yesterday he was panting when it wasn't that hot. I rubbed some water on his head and body and took her to a drafty window. The next morning he fell over and some blood tinged saliva came out of his mouth. A few minutes later I fed him a piece of cheese and he ate it. He then looked up at the couch, so I put him on it. He arched his back (head up) and then down and out came bloody foam from his nose and mouth and he was gone. Please help me to understand what happened? Last visit to the vet about a year ago, he was ok.
How shocking to watch your beloved pet die in front of your very eyes, especially when you weren't expecting it. I know you're grieving for your friend and of course you're seeking to understand what happened. Have you been together for 16 years? A "few bouts of coughing and vomiting treats once in a while" doesn't sound like anything to be alarmed about for any dog. This lack of symptoms and sudden death you described sounds like a blood clot in the lungs, or "pulmonary embolus". It's possible that a vet might have found something to treat if you had taken him in, but just as likely not. Blood clots aren't usually detected on a normal exam. Mealtime at my house, like for most couples, is a time when my husband and I catch one another up with the interesting parts of our workday. He is a paramedic and I'm a vet, so suffice it to say we talk about things most people don't want to hear about while they're eating. Often I'll hear stories about people who die this suddenly, after they "just had their yearly check-up last week". Family members are naturally, shocked, guilt-ridden and like you, seeking answers. Most often, these people have died from a blood clot in the lungs, and no one saw it coming. When our loved ones die after long, lingering illnesses, we have time to "get used to the idea", and although we are extremely sad when they die, we're not as shocked. But sudden deaths can leave us feeling blindsided and lost. Consider planning a memorial service to honor his life. And remember to consult a grief counselor if you are having a hard time recovering. It helps to have someone to talk to. I'm terribly sorry for your loss, Carmela. 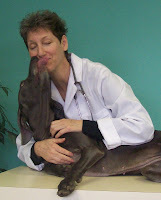 Write to LetsAdoptaDogPark@gmail.com with your question for Dr. Pat. For a personal consultation about your pet's needs, visit Holistic Veterinary Services. To our readers: Carmela's loss has inspired us to establish a "Rainbow Bridge Memorial Page" here at All Things Dog Blog. This is a page where you can submit a photo of your own fallen angel. We will include his name, a quote about him, his philosophy or your sentiments, along with his picture. On this page, you will also find the Rainbow Bridge story, set to beautiful music. You will be able to visit your lost companion as often as you like, and enjoy soothing music while you look at your friend, and all of his playmates at the Rainbow Bridge. We invite you to submit your photos of lost pups to LetsAdoptaDogPark@gmail.com with the requested information. To assist us in staying organized, be sure to place a notation in the subject line about Rainbow Bridge. Thank you for your participation. We look forward to sharing your fallen angels.